There was a moment in time long before you were a blimp on the sonar nestled in your mothers womb when God delighted in the you which was yet to be formed. There was a plan already written by the heart of God for your life. There was a way you should go and a way you should not. There was a love that has never dimmed, only brightened as you stepped forward into the promise of life He offered through faith in His only child, Jesus Christ. There was a path prepared that only you could walk, for in creating you He had a purpose only you could fulfill. Too often in life we're looking left and right at what everyone else is doing, at what appears to be popular, fruitful, beautiful, exciting, prosperous or healthful in another's life. But that's the key difference between you and them, me and you - we each have different lives, different God given callings, different strengths and weaknesses, different skills, different levels of understanding or numerous other dissimilarities. It may seem as though someone else is blessed far more than you, but this is when we must ask ourselves "what describes a blessing?" After all, not all that seems good is a real blessing. What you or I may consider a blessing in a person's life may not be one in God's eyes because He can see beyond the superficial world to what lies beneath, to what dwells in the heart, to what lurks in the darkness, to what lies around the bend, to the cost that person may one day pay. What you or I may see as a trial could be God's blessing to grow us, equip us for the calling ahead, or to teach us holy truths we'd never learn any other way. God's ways are not man's ways. God's ways are not even understood by man. Yes indeed, God can give us immense blessings that send our hearts soaring but can you trust that there are blessings He brings into our lives which we despair of? Can you trust His plan for you? Can you submit to the unique call on your life which He put in place before you were conceived, the individual path He asks you to walk along? Or...are you content not to rock the boat which holds your life as you choose it to be, not to make the changes He's impressing on your heart, not to be open about your Christianity, not to extend your faith and step forward into the mystery of where God will lead? Works will not save us. Only faith in Jesus Christ can do that through the grace of God. 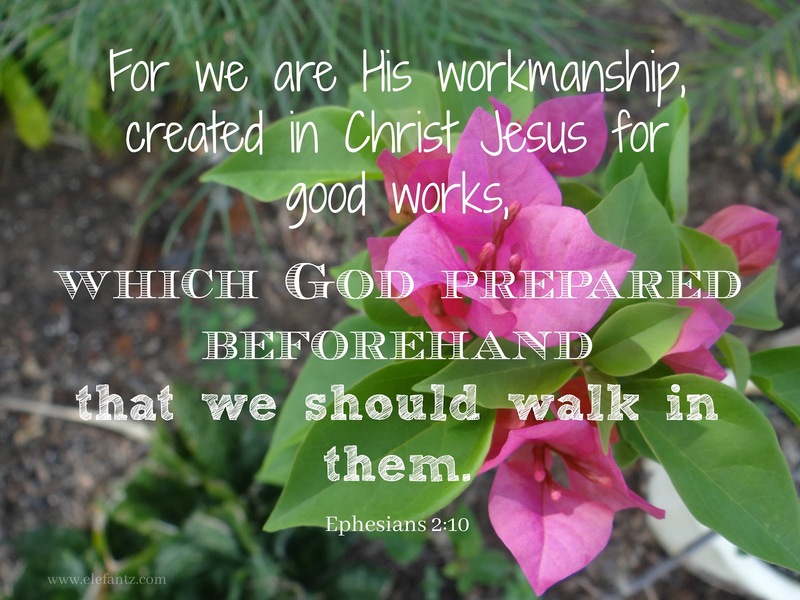 But when we live our lives for Christ, when we hunger for His Word and spend time every day letting it teach and grow us, when we put into action the example of Jesus by how we behave and live our lives, then we will naturally step into those good works God prepared before we were born and do them. Let's stop looking to the left and right at the lives of others and keep our eyes fixed solely on Jesus, the author and perfecter of our faith, by following His call for our unique and God-gifted lives. Praise Him for we are wonderfully made and God doesn't make what He cannot use. He wrote my life story and He wrote your life story. God does not need an editor to make changes, He only needs you and I to trust and obey that there is a blessing in it, beyond what we can imagine in this earthly life, a blessing which will lead us where only we can go. Yes, that's it, exactly as I perceive it, too. There is a calling, and there are blessings, and sometimes we don't see or understand how much of a blessing a trial can be. But all these things are for our good and will give us experience that we need. Thanks, Jenny, you are so eloquent in Christ. Thank you so very much for your words. I needed to hear them! Love and blessings. Thanks for the reminder. Many blessings on you. This is exactly what I need to think about during my current family situation. Thank you for sharing. Have a blessed day. Amen!! We don't need to edit God's plan for us - it is perfect, for us!! My goal is to keep myself in the center of His will for my life, because I totally rest in Him...my everything! Blessings!!! Thank you! Exactly the encouragement I need today. Once again your Sunday post was right on and confirming of what God has been whispering to my heart (and I have been struggling with) Thank you so much for how much you share, not just all your free patterns, but your life and your faith.